Universal Monsters - Frankenstein Head Sculpted Keychain - JUST IN! 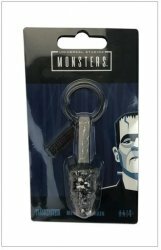 MyMovieMonsters.com > Other Ghoulectibles > Universal Monsters - Frankenstein Head Sculpted Keychain - JUST IN! Universal Monsters - Frankenstein Head Sculpted Keychain. The Frankenstein Monster's head is approximately 1 1/2 inch tall by 1 inch wide, with chain and key ring. Comes packaged on bubble card as shown. 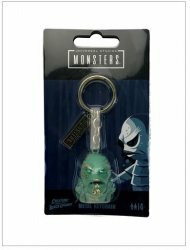 Also want the Creature from the Black Lagoon key chain? Use the convenient Buy Both button below. Universal Monsters - Creature From The Black Lagoon Keychain - JUST IN!